This sets the sale type for every new sale you begin. It can be changed for individual sales on the general tab of the new sale. When a cobuyer is added to any new sale their relationship to the customer will default to whatever is set here. It can be updated at the bottom of the cobuyer screen for that sale. Allows you to assign a standard customer rating for every sale. This can be modified on the customer tab of a new sale. Frazer will automatically warn you if a customer is younger than the age listed here. You'll get the warning when you enter the customer's date of birth on a sale. If you would like to track the profit for a deal you are working on check the “Display profit on sales screen” box. You can customize the label of the button that will appear on the general tab of the enter sales screen in the text box here. You can also customize the profit value shown by factoring interest and lot fee into the profit calculation. It's important to note that Frazer cannot calculate commission automatically. You must go into the dealer costs tab of a sale and calculate commission manually on a sale. This makes calculating that number much more simple. If your practice is to allow your customers 45 days before the first payment you can have the Frazer system determine that automatically by checking this box.. Since February has fewer days than other months, checking this box will give customers a full 30 days before their first payment even when their sales close in February. Federal regulations require that a pickup note must be paid in full prior to the second contract due date. Checking this will automatically push the due date out past the pickup note due dates. 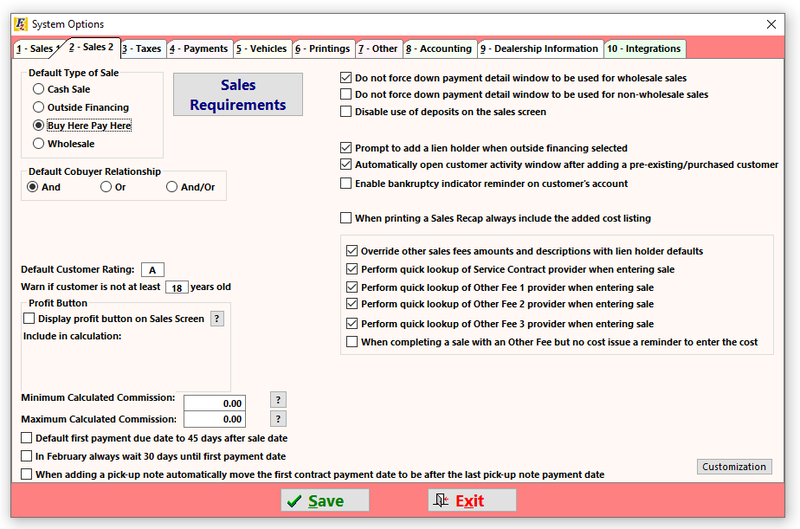 If you do not take cash to hold vehicles you can remove the deposit field form the sales screen here. Checking this box will prompt you to add a lien holder when you set the deal type to Outside Finance. If you would like to overwrite other system defaults when you add a new lienholder to a sale, you can check here. This will apply the lienholder defaults instead. You can also choose to to be prompted to apply service contract or other fee providers as they are entered on a sale or be reminded to add your costs for optional fees when completing a sale. If you would like to be able to find credit information on prospective customers, Frazer is integrated with two companies that you can work with to pull credit reports. Find out more about Corelogic Credco and 700Credit by clicking on the buttons inside. Frazer is integrated with a number of GPS and Starter Interrupt Device service providers. Clicking on the name of most available provider will show links to more information. If you are working with one of the Service Contract Providers integrated with the Frazer software, you can enter the necessary credentials to use the integration here. If you are not currently working with one of our integration partners you can also find out more about them here.